My mom is the queen of yard sales. She can find anything. I asked her to keep an eye out for the 1969 Betty Crocker's Cookbook she used when I was growing up and she found one... plus these other cookbooks. Of course I left the one I really wanted... the big red 1969 version at my parents' house so I only have these four to use 'til I go home again. I love cool finds like those. 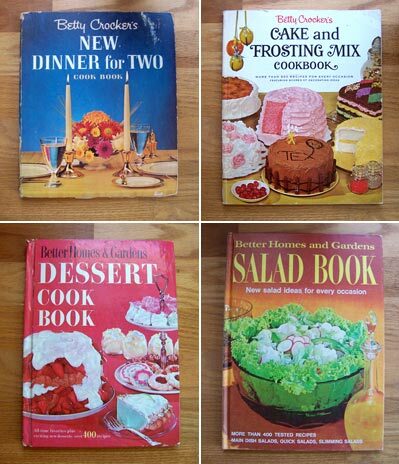 I actually collect oookbooks of this era and am envious of the cake and frosting mix one, that has got to have some fun recipes in it. I have a party recipe book from this set that is pretty sweet with some fun cakes. My mom still has her red Betty Crocker cook book. It comes in handy sometimes. In fact, I just used it the other night to cook fresh beets, which I'd never done before. My mom has got the 1972 version. I still use it today for my cheesecakes and for an awesome angel food cake with chocolate cream frosting. Yum! My mother is a baker, by profession. I grew up looking at her cookbooks, and as I child, I LOVED the Cake & Frosting Mix cookbook! I wore it out looking at the pictures which aggravated my mom to no end! So, for a surprise about 3 years ago, I found her 2 copies of it. She could finally throw away the pages she had saved all these years (the cover & spine of the book were long gone.) She was kind enough to give me the extra one! Awesome. I have the dinner for two one. the dessert cookbook gives me a majorly awesome childhood flashback. the Betty Crocker cook book gave me flashbacks too! I loved lying on the kitchen floor and flipping through the book. I usually skipped the meats and veggies and concentrated on the desserts and candies. I am on my way to Ebay to find some of those cookbooks. Those old recipes bring back some yummy memories. These books remind me of James Lileks and the Gallery of Regrettable Food. The recipes may be great, but the pictures he displays from the meat cookbook are a little scary. And of course he writes a little commentary about each one--some of them are pretty funny. It's funny that you mentioned these books as I have been very into them lately. I have been picking them up at library book sales, thrift stores, and yard sales for the past year. Just today I got about 30 of them for $4. They are very entertaining. I started cutting up my duplicates last week and making greeting cards along with colorful scrapbook paper, sequins, and rick-rack. They were a big hit at the Farmer's Market last weekend. They got a lot of laughs and I sold quite a few. Fun stuff! Also, we always had the 1969 version of the Betty Crocker in my house. I have the Dinner for Two one also -- my Mom gave me her copy (it was her first cookbook) when I got married. Love the retro-find postings! I have my grandmother's 1961 Betty Crocker and it is a treasure! I looked at Powell's once for same as gift and was totally blown away by the prices! I hope you can help me.. my Mom has the 1961 Betty Crocker Picture Cookbook... I've used the "Jewish Challah Braid" recipe from page 106 since I was 12..however.. this yr I needed the exact recipe and pages 102-106 are missing.. can anyone help.. I would love to have this recipe again.. it is simply the best tasting bread ....ever!! !